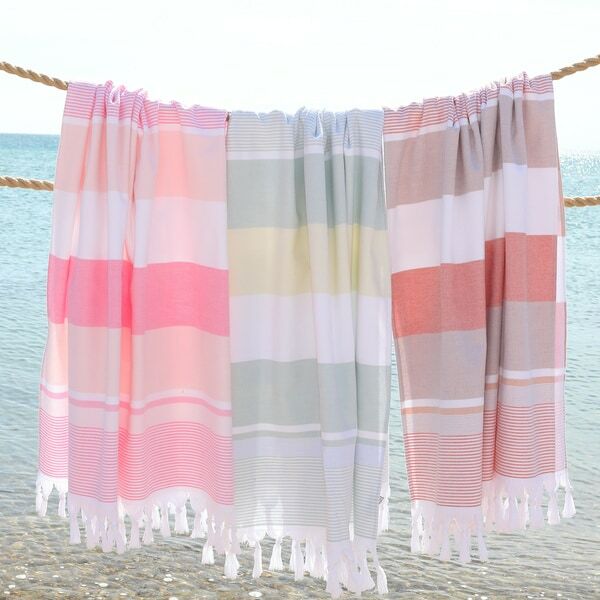 Dry up after a shower or lay down comfortably at the beach with this bath and beach towel. Turkish cotton combines softness and durability, and the fringe adds unconventional style. The striped pattern makes this towel easy to identify and adds a bit of color to your home. I love Turkish towels, they dry very quickly after each shower, and never take on a mildew scent in the summer months. Me only disappointment with this towel is that it is an inch and a half shorter than my other bath sheets, but other than that great. This towel is perfect for the beach. It is very soft and light. It fits perfect in my beach bag. It also does not hold sand on to it which is great. I adore this towel set. They were prefect for our beach trip. The work great as a towel but can also be used as a sarong. this towel has a looped texture on the inside and a smooth texture on the outside. Therefore , it is a bit thicker than other turkish towels I have seen, but a very nice towel anyway. These towels are really nice. We have yet to use them by I can’t wait for beach season so that we can use our lightweight towels. The fabric coloring is beautiful. Lovely color -- I bought the blue one. Washed well and dries quickly after use. I bought this as a present for our beach friend. It is really lovely, very light, so I don't know if it is better for a wrap than a beach blanket. Would be perfect for the pool. It makes a lovely present. Love these towels. My all time favs! These are now my favorite towels of all. I get compliments all the time. They wash and dry up so nicely. I want to order more and in every color available. Very pretty colors and soft. love the fabric, just enough to cuddle up in on a summers evening. Theses are so pretty it was hard too choose. Not too heavy, not too light. Good choice. I can't wait to use it at the beach. Just like the picture.